I spent a lot of time this weekend working on a top-secret Christmas present project. The only thing I can say at the moment is that it involves looking through old recipes, about it something I rarely do. Re-reading old posts and old recipes, this I remembered some favorites I’d long forgotten. 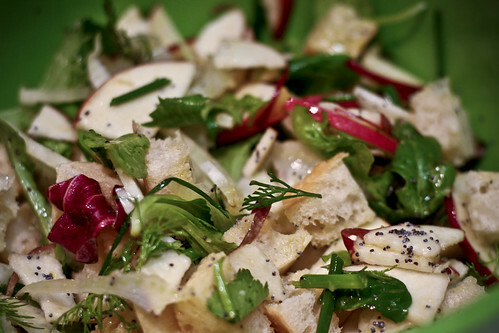 This apple fennel panzanella is one of them. Panzanella is usually a late summer dish and a great way to use fresh garden tomatoes. Instead of the more traditional tomatoes and cucumbers, I use apples and fennel which are much more season-appropriate. The red and green also make a for a festive Holiday presentation. *I used an â€œHerb Saladâ€ mix. You might want to add any fresh herbs youâ€™ve got in the fridge to this as well – basil, cilantro and dill work well. Looks great -and I’m loving that vinaigrette recipe – simple and straight to the point – looks great!